Karin Gruber, PhD, earned her degree in biology. She hast a year-long experience in marketing and public relations. Most of her projects are related to life sciences, and most of her business partners come from the life science sector. 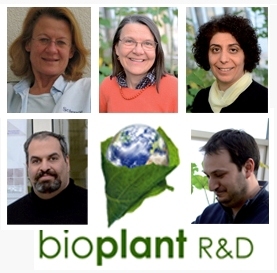 As co-founder of Bioplant R&D she is responsible for the management and marketing agendas of Bioplant R & D.
Margit Laimer, Univ. Prof. Dr. studied botany and received her habilitations in plant biotechnology and plant virology. She was involved in the development of healthy and resistant fruit trees and grapevines, of detection assays for viruses and phytoplasmas, of assays for fruit allergens and of tools for the genetic improvement of health benefits in small fruits. She is a co-founder of Bioplant R&D. Fatemeh Maghuly, Priv.Doz.Dr. obtained a PhD degree in genetics and population genetics and a habilitation in functional plant genomics from BOKU University in Austria. She specialized in population genetics in forest and fruit trees, the development and application of nucleic acid based polymorphic markers (SNPs, microsatellites and mitochondrial), and the analyses of gene expression in transgenic crop plants. She is a co-founder of Bioplant R&D. Gorji Marzban, Dr. studied human nutrition and recieved his doctor degree in food and biotechnology. As Head for QC in Polymun Scientific GesmbH, he established the QM-system for the production of biopharmaceuticals. His scientific expertise involves protein and allergen analytics. He is a co-founder of Bioplant R&D. Alberto Calari, Dr. graduated in Agricultural Science at the University of Bologna, where he was working as researcher at DISTA – Department of Agroambiemtal Sciences and Technologies on phytoplama diseases of plants and their detection, before joining Bioplant R&D. He is an expert in plant production, phytopathology and pest control.